Summary: A win brought them together, but loss may tear them apart. I had the pleasure of meeting Marybeth Mayhew Whalen at last year's SIBA. She's a pretty amazing woman. Not only is she super-sweet and an acclaimed author, but she's also a mom of six. And oh yeah -- she's the co-founder of shereads.com too. I honestly don't know how she does it! Her latest novel is titled WHEN WE WERE WORTHY, and I found it to be a terrific read. WHEN WE WERE WORTHY is a touching story about a tragedy that tears apart a small town. Worthy, Georgia, is a pretty typical southern town that loves Friday nights and their high school football team. However, the binds that keep this town together are torn apart one Friday night when three cheerleaders are killed in an automobile crash. Rumors and accusations start spreading about who is responsible for the crash, why wasn't one of the cheerleaders with her friends, and more! 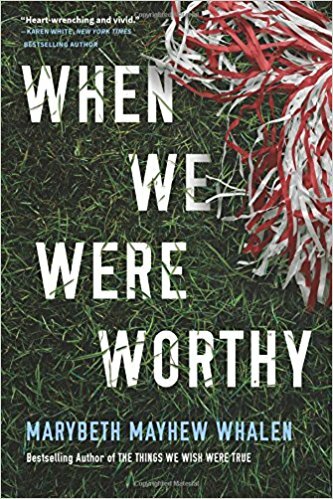 WHEN WE WERE WORTHY explores what happens to four women after this accident threatens to tear their lives apart. Marglyn is the mother of one of the victims, Darcy is the mother of the boy who is being blamed for the accident, Ava is a substitute teacher at the school with a secret, and Leah is the cheerleader who "should" have been in the car with her friends. The novel is told through their eyes in alternating chapters, and all of them are battling their own demons while trying to move forward after this devastating tragedy. I thoroughly enjoyed WHEN WE WERE WORTHY! It is one of those books that has memorable characters and an intriguing storyline, but it also touches your heart and makes you think. It really is a very good book that reminds me why I love to read. In fact, this novel would be an excellent selection for book clubs especially ones made up of mothers... but more on that later. WHEN WE WERE WORTHY is a spot-on novel about small towns and the people who live there, and I think many readers will relate to this novel. Whether it was the close-knit community or the rumors that fly in small towns, I know I could definitely see my friends and town in this novel. And I think that's one of the reasons I enjoyed this book so much. It was very real... and it seemed like it could happen to me or someone I know! As much as I could relate to Ms. Whalen's fictional characters and setting, what really resonated with me about WHEN WE WERE WORTHY was one specific character -- Marglyn. Marglyn was the mother of one of the girls who was killed in the accident. She and her daughter didn't always have the perfect relationship -- what mom and teenage daughter do? But it just about broke my heart that their last interaction before the accident was an argument. Marglyn was not only grieving her beautiful daughter, but she felt guilty about their last discussion and her parenting as a whole. I can't even begin to tell you how much this character affected me while I was reading this book. I just couldn't stop thinking about her pain. But what I loved most about this book was that it was a celebration of women... and especially mothers. As depressing as this novel was for much of it, the story ultimately left me with a feeling of hope and redemption. All of the main characters were women who were experiencing some pretty horrible events; however, they all showed an inner strength that will make female readers proud to be women. I really, really liked WHEN WE WERE WORTHY. It's a well-written novel about the strength and resilience of the human spirit in the face of tragedy, and I highly recommend it to fans of women's fiction. I love Mary Beth and am so glad to see her success. This sounds terrific! This is one I probably would have passed over because at first glance, I thought it was YA. I'm glad I took the time to read your review. It sounds so good!